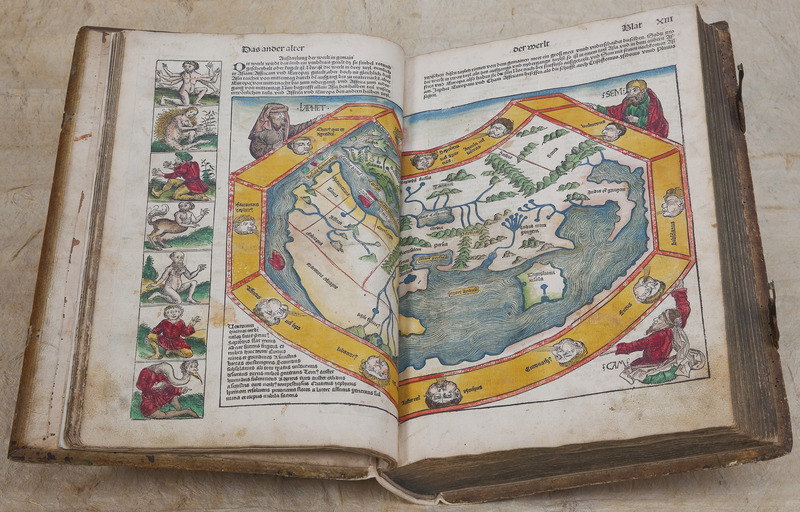 One of our copies of Liber Chronicarum (the “Nuremberg Chronicle”), published in 1493, which offers nothing less than a representative picture of geographical and historical knowledge on the eve of Columbus’s voyages and the expansion of Europe into the western hemisphere. 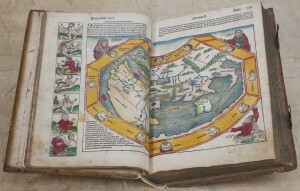 Many of the illustrations, such as the two-page view of Jerusalem, were based on the most recent reports of travelers (usually merchants). For those students and faculty who wish to read this book and do not know Latin, we have just acquired the first two volumes of an excellent new translation, which will make this landmark book accessible to all undergraduates. 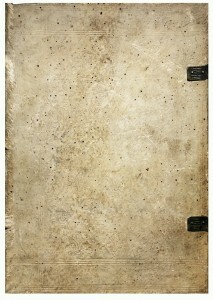 Comments Off on Book history! If you only visit the Watkinson once this semester, let it be this week! One of the most famous birds in the Audubon (both because of the artistry and because it is now extinct) is on display until Friday. “Doubtless, kind reader, you will say, while looking at the seven figures of Parakeets represented in the plate, that I spared not my labour. I never do, so anxious am I to promote your pleasure . . . The Parrot does not satisfy himself with cockle-burs, but eats or destroys almost every kind of fruit indiscriminately, and on this account is always an unwelcome visitor to the planter, the farmer, or the gardener. The stacks of grain put up in the field are resorted to by flocks of these birds, which frequently cover them so entirely, that they present to the eye the same effect as if a brilliantly coloured carpet had been thrown over them. They cling around the whole stack, pull out the straws, and destroy twice as much of the grain as would suffice to satisfy their hunger. They assail the pear and apple-trees, when the fruit is yet very small and far from being ripe, and this merely for the sake of the seeds. As on the stalks of corn, they alight on the apple-trees of our orchards, or the pear-trees in the gardens, in great numbers; and, as if through mere mischief, pluck off the fruits, open them up to the core, and, disappointed at the sight of the seeds, which are yet soft and of a milky consistence, drop the apple or pear, and pluck another, passing from branch to branch, until the trees which were before so promising, are left completely stripped, like the ship water-logged and abandoned by its crew, floating on the yet agitated waves, after the tempest has ceased. They visit the mulberries, pecan-nuts, grapes, and even the seeds of the dog-wood, before they are ripe, and on all commit similar depredations. The maize alone never attracts their notice. –J. J. Audubon, Ornithological Biography, I (1831), 135-136 [excerpts]. We have just unpacked eight (8) cartons of just over 300 books on Russian ornithology which we purchased from a well-respected Dutch antiquarian book dealer. These books were originally part of a much larger collection put together by the great bibliophile Henry Bradley Martin (1906-1988), whose collections of ornithology, 16th- and 17th-century English literature, and 19th-century American and French literature were sold through Sotheby’s (New York) in several well-publicized sales in 1989. 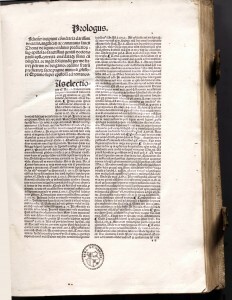 The books and pamphlets you see here constituted about half of Lot 1845 of Sale 5953 (Session II, December 13, 1989), which was purchased by another Dutch dealer. Of 300 titles, Trinity has 17, Yale has 18, and Cornell has 17. 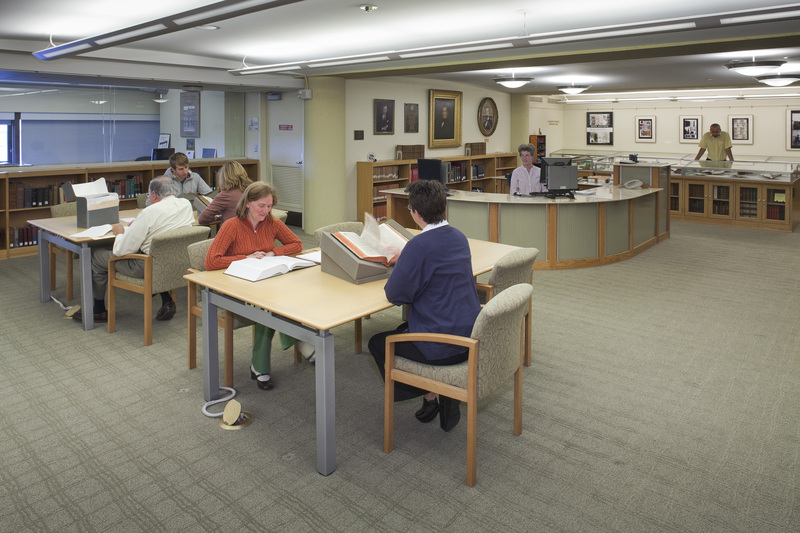 There is considerable overlap–of the titles owned by the three libraries, 7 are only at Trinity, 3 are at both Trinity & Yale, 4 are only at Yale, 6 are at both Yale and Cornell, 6 are only at Cornell, and 5 are at all three places. 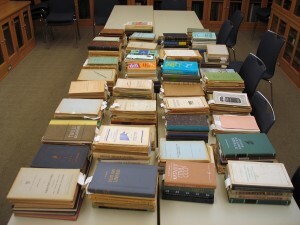 With this acquisition, over 280 titles can only be found here at Trinity. Comments Off on This just in–Russian ornithology! This little nugget is part of a small display in the Trinity College Library atrium that I have put up of books and documents in the library relating to the sinking of the Titanic, which happened 100 years ago on April 15, 1912. 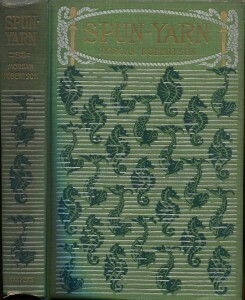 Spun-Yarn: Sea Stories. 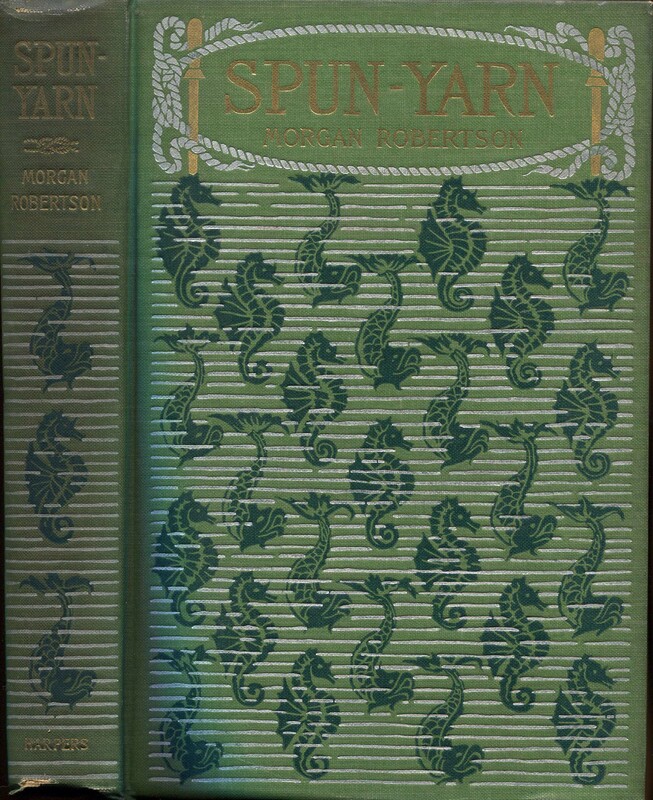 Morgan Robertson (New York, 1898). A collection of five sea-stories by the author of Futility, published the same year and mentioned below. Morgan Andrew Robertson was born in Oswego, NY in 1861, the son of a Great Lakes ship captain. He served in the merchant marine from 1877-86, became a jeweler in New York until his eyes failed him, and then made a meager living writing until he died almost penniless in 1915. In 1898 Robertson concocted a novel about a fabulous Atlantic liner, far larger than any that had ever been built. Robertson loaded his ship with rich and complacent people and then wrecked it one cold April night on an iceberg. This somehow showed the futility of everything, and in fact, the book was called Futility when it appeared that year. On April 10, 1912, the real ship left Southampton on her maiden voyage to New York. Her cargo included a priceless copy of the Rubáiyát of Omar Khayyám and a list of passengers collectively worth $250 million dollars ($100 billion today). On her way over she too struck an iceberg and went down on a cold April night. Robertson called his ship the Titan; the White Star Line called its ship the Titanic. The Watkinson is proud to announce its admission to the New England Regional Fellowship Consortium (NERFC), which now boasts eighteen members from Connecticut to Maine. 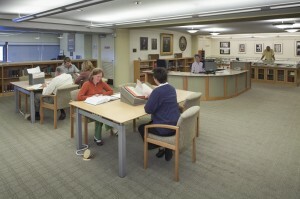 Scholars locally, nationally, and abroad can now apply for a fellowship to visit the Watkinson (and others, like our Hartford sister CHS) during the next funding cycle, which will be the 2013-14 academic year. In the meantime, we are full voting members, and will be taking the opportunity to discuss our collections with the membership and learn about theirs in turn. “The Song Sparrow is one of the most abundant of its tribe in Louisiana, during winter. This abundance is easily accounted for by the circumstance that it rears three broods in the year:– six, five, and three young at each time, making fourteen per annum from a single pair . . . you will readily conceive how a whole flock of Song Sparrows may in a very short time be produced . . . I have at all times been very partial to the Song Sparrow; for although its attire is exceedingly plain,it is pleasing to hear it, in the Middle States, singing earlier in spring, and later in autumn, than almost any other bird. 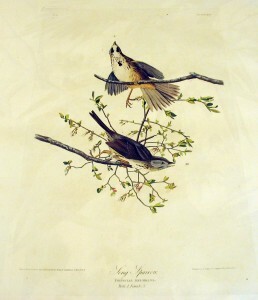 Its song is sweet, of considerable duration, and performed at all hours of the day . . . The flight of the Song Sparrow is short, and much undulated, when the bird is high in the air, but swifter and more level when it is near the ground. They migrate by night, singly or in straggling troops . . . it is a fine, plump bird, and becomes very flat [sic] and juicy . . . they feed on grass seeds, some berries and insects, especially grasshoppers, and now and then pursue flies on the wing . . .
–J. 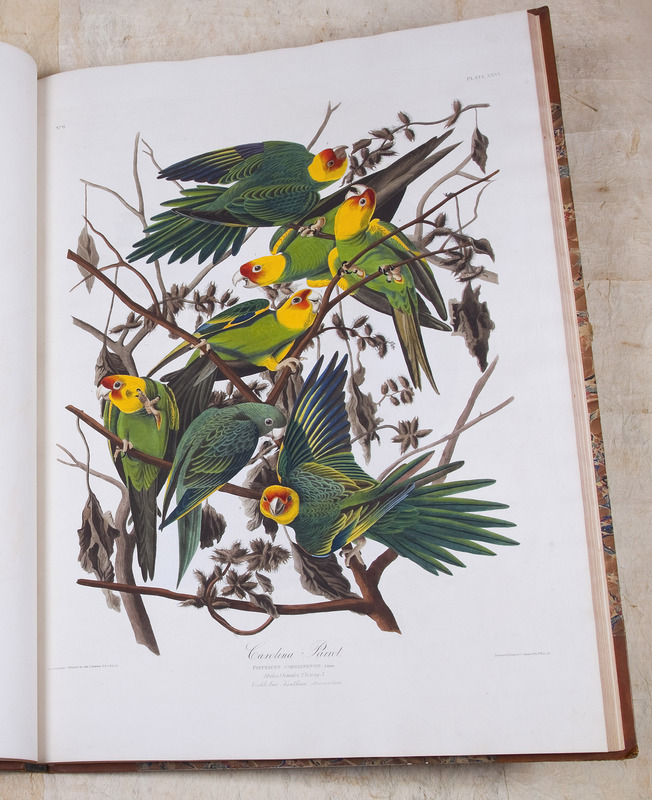 J. Audubon, Ornithological Biography, I (1831), 126-128 [excerpts]. 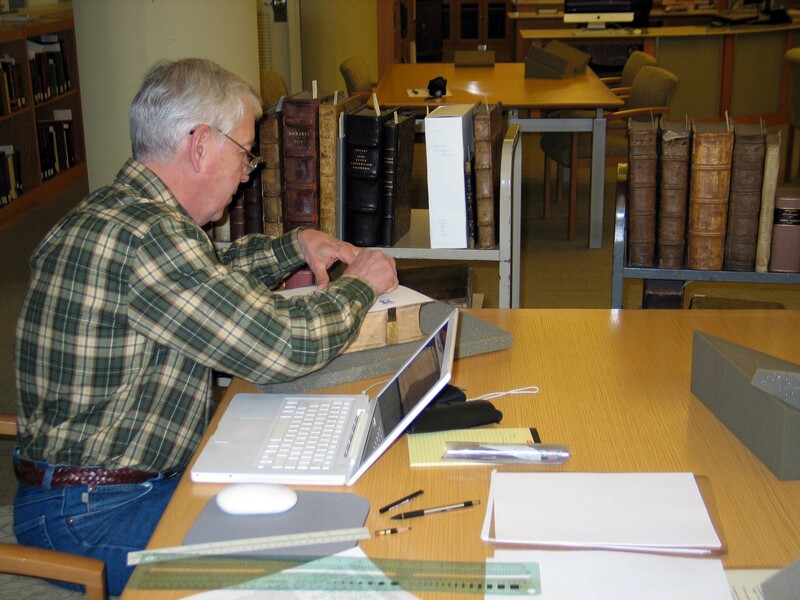 We have been delighted to welcome Scott Husby, former book conservator at Princeton University and for years prior to that a professional bookbinder under his own shingle. 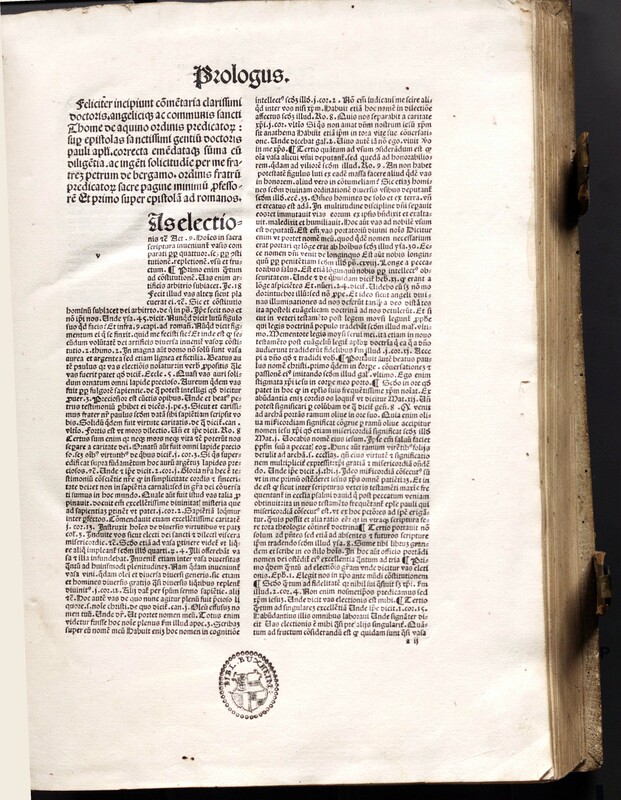 Scott is working on a retirement project which will be a truly vital resource for book history: a database of “incunable” bindings–that is, bindings on books printed before 1501 (termed incunabula, Latin for “cradle,” referring to the early period of printing in Europe between 1450 and 1500). Scott has visited over 30 libraries and described the bindings of over 23,000 volumes. 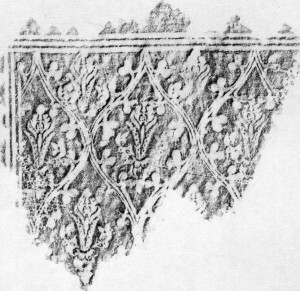 He has taken photographs, but more importantly for identification purposes, rubbings of bindings which are contemporary with their contents: placing a piece of acid-free paper over the binding and rubbing lightly with pencil reveals many tooling marks that you cannot see as well with a photo; one can identify most of the 15thC binderies by their tools. 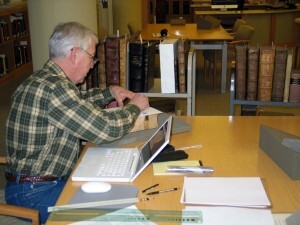 Scott is also making note of later bindings, and dating them when possible, so his database is also a record of what has been done with these books over the centuries. 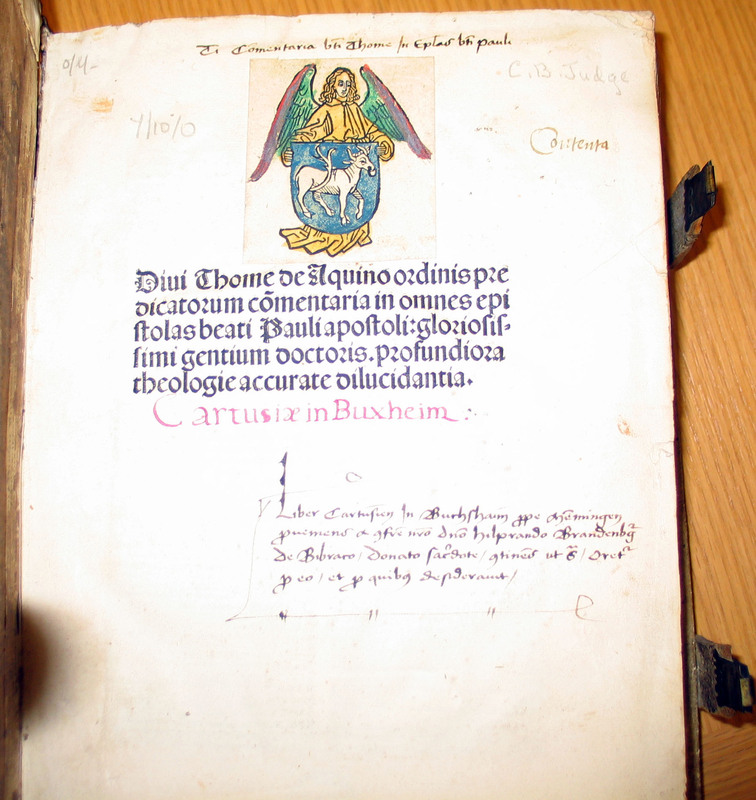 The book he is working on in the pics shown here is a 1495 edition of the commentaries on the epistles of Paul by St. Thomas Aquinas (1225-1274), and bears the bookplate of the Buxheim Library, which was dispersed in 1883. Shown here also is the front cover and the first page of text, where you can see a blank space reserved for a larger painted initial letter which was never completed. 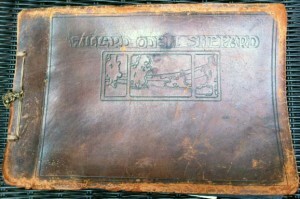 We recently received a gift of a photo album relating to our Odell Shepard collection. It was a Christmas present to Willard Odell Shepard (Odell’s son) from his Aunt Irene Wood in 1914 and has mounted baby pictures and family photos from that year until 1928. 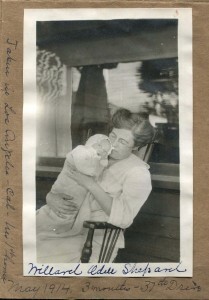 There are also a number of loose photos, many taken by Odell, as well as a small, handmade album with additional family photos. A distant relation to the family “rescued” this from eBay several years ago, and decided to give it to us–an excellent choice, and we will take care of it forever and well! “The many kind attentions which I have received from the celebrated author of the Life of Leo the Tenth, joined to the valuable advice with which I have been favoured by that excellent gentleman*[see below], has induced me to honour the little bird before you with his name. I shot it in a deep swamp not far from the River Mississippi, in the State bearing the same name, in September 1821. It was flitting among the top branches of a high Cypress, when I first observed it, moving sideways, searching for insects, and occasionally following one on the wing. It uttered a single twit repeated at short intervals. It having unexpectedly flown to a distant tree of the species on a branch of which you now see it, I followed it and shot it. It was the only one of the kind I have ever seen, although I went to the same swamp for several days in succession. It proved a male, and was to all appearance in perfect plumage. The gizzard was nearly filled with very minute red insects, found on Cypress and Pines, the wings of different flies, and the heads of red ants. 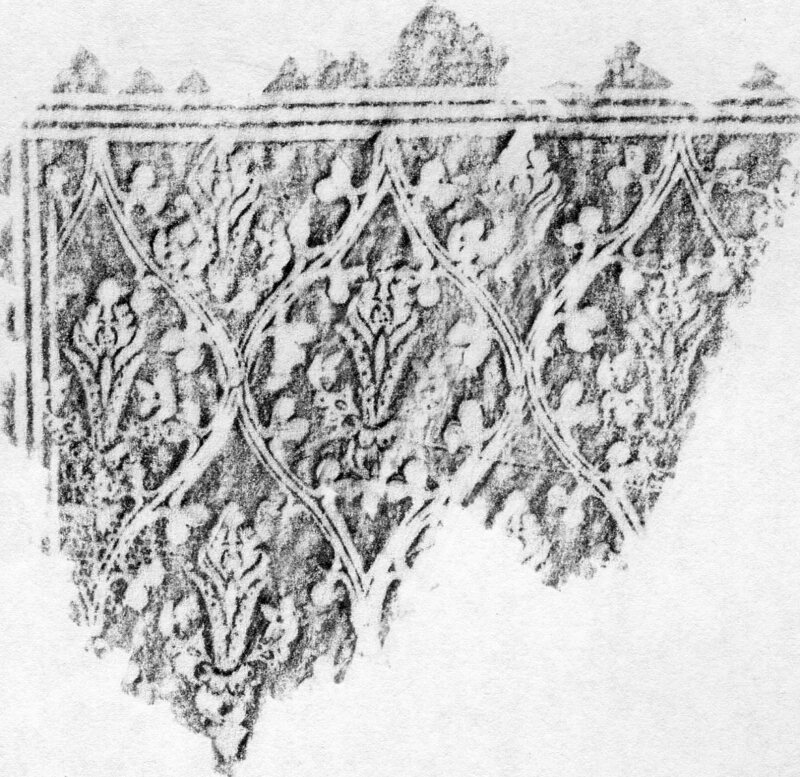 –J. J. Audubon, Ornithological Biography, I (1831), 124. *William Roscoe (1753-1831), historian and patron of arts, was the son of a Liverpool innkeeper who eventually spent two decades in what he described as the laborious and distasteful profession of an attorney. He also enjoyed literary and naturalist pursuits, and was a staunch abolitionist, for which he experienced much pain and suffering in his native city. 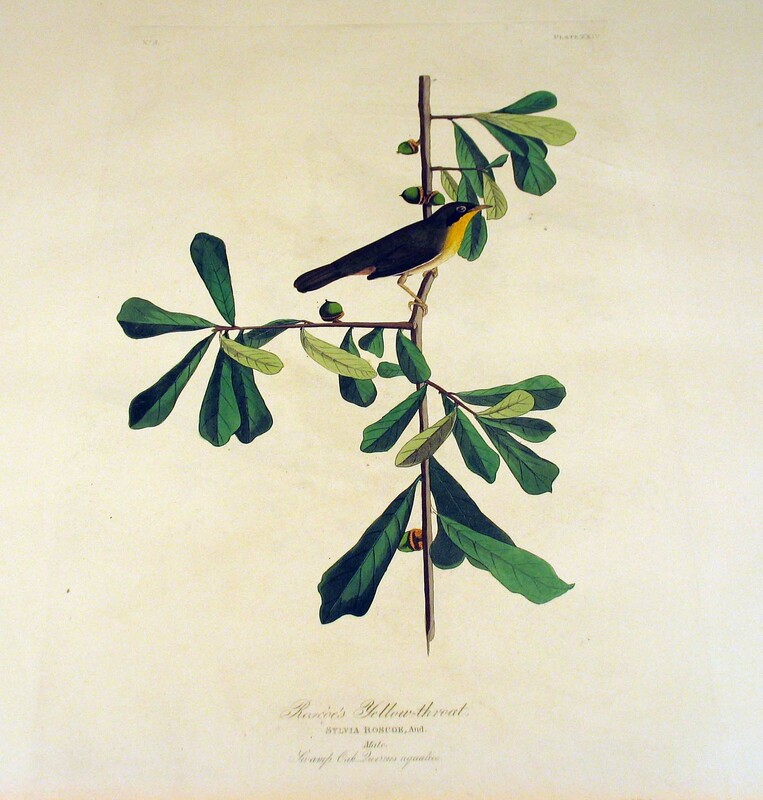 Roscoe was one of Audubon’s first champions in England, and as the first president of the Liverpool Royal Institution, he provided many valuable contacts to Audubon as the naturalist began to drum up support for his book. Posted by: rring	in Random! The library has about 25,000 pieces of sheet music in bound volumes or loose in boxes. The latter is divided into two categories, vocal and instrumental, and arranged alphabetically by composer. 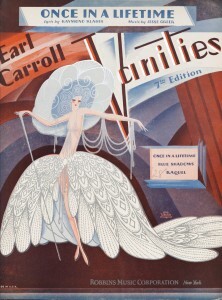 Most of the sheet music was published in the United States, but there is also a considerable number of English and German publications. The collection encompasses the period from the late 18th century to the 1950’s and covers a wide variety of both classical and popular, sacred and secular music. There are many examples of lithographed covers, popular songs of the late 18th and early 19t centuries, original editions of Stephen Foster, the Christy Minstrel songs, early jazz and blues. For more on our music holdings see our guide to music in the Watkinson. The cover shown here is for a song written by Jesse Greer (1896-1970), a pianist and composer who was most active in the late 1920’s through early 1940’s. He often collaborated with lyricist Ray Klages (as here). Fun Fact: The Greer Music Library at Connecticut College is named in honor of Jesse Greer and his wife, Josephine Lauter Greer. Comments Off on Strike up the band! 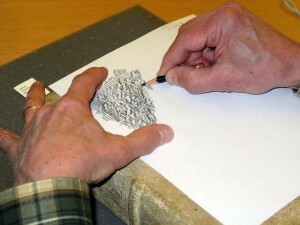 You are currently browsing the The Bibliophile's Lair blog archives for March, 2012.